We had one more night at Fowey and Andrew being optimistic for warmer weather set up the BBQ; although we didn't BBQ that night as it was definitely too cold. We left at a sensible mid morning in glorious sunshine and a gentle breeze, but enough to sail across St Austell Bay. At lunchtime, a mere 6 miles away we reached the cute little Port Mellon cove at Mevagissey, so dropped the anchor in a glassy sea for lunch. We had heard that Mussels could be found on rocks in the bay so launched the tender at low tide and went armed with appropriate mussel gathering tools in search of dinner. Sadly we couldn't find any, however we did find a very cute dolphin - we think it was a Risso's Dolphin, which has a rounded head. We then took the dinghy into Megavissey which has a drying harbour - then when we were heading back to the boat we were treated by two Pilot Whales frolicking in the sun - they stayed a while and we managed to get some nice video. We also saw the biggest jelly fish ever in the bay and possibly a seal too - wow! We had such a lovely afternoon and the weather was settled so we decided to stay the night, have a BBQ and do some fishing. Fishing and a BBQ - how very Australian! 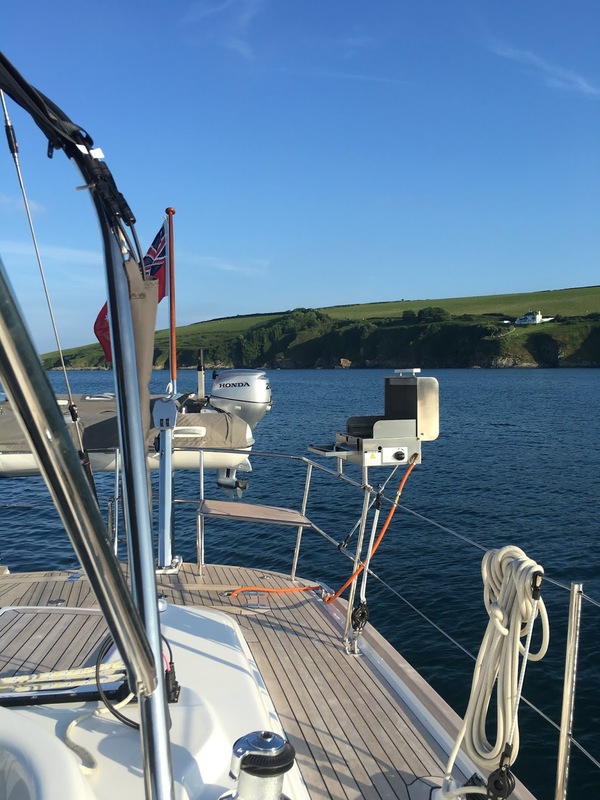 We didn't catch any fish but had a lovely first night at anchor. 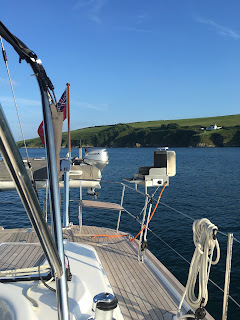 Next morning there was still no wind so we motored onto Falmouth - about 15 miles. On the way the Norwegian Navy and British Navy were engaged in some firing practice - it was quite loud and we could see smoke even though we were 5 miles away. Andrew called them on the radio and we were advised politely to get a bit closer to the land - we promptly did! We took a mooring ball for the night just off the quay at Falmouth and went on a mission to re-provsion, as we had run out of fresh food, and also explore the town. The town was lovely and has some really nice restaurants and cute shops, parts of it are seriously old! It was our first really hot day - finally! Next morning the weather was quite cold and gloomy, so Carolyn finally managed to get a bit of girl time with a hair cut n colour plus a pedi at a lovely salon in town, while Andrew did laundry on the boat (yes seriously) - a double treat! We then had a visit from Nick who keeps his boat in the harbour, before we decided to head up the River Fal to explore. Falmouth Harbour is actually a flooded river, the river itself is really deep and narrow, however it stretches into a huge expanse of shallow water -the depths can go from 2 to 22 metres. We are currently anchored right up the top of the river, where all you can hear is birds - its really nice and away from the fog down at the estuary. Hey Kim & Annette, great to hear from you - we are heading East back to the Solent in the next few days so will miss you in the South West but will maybe catch you in Brest, which is on our route after a pitstop in Southampton.